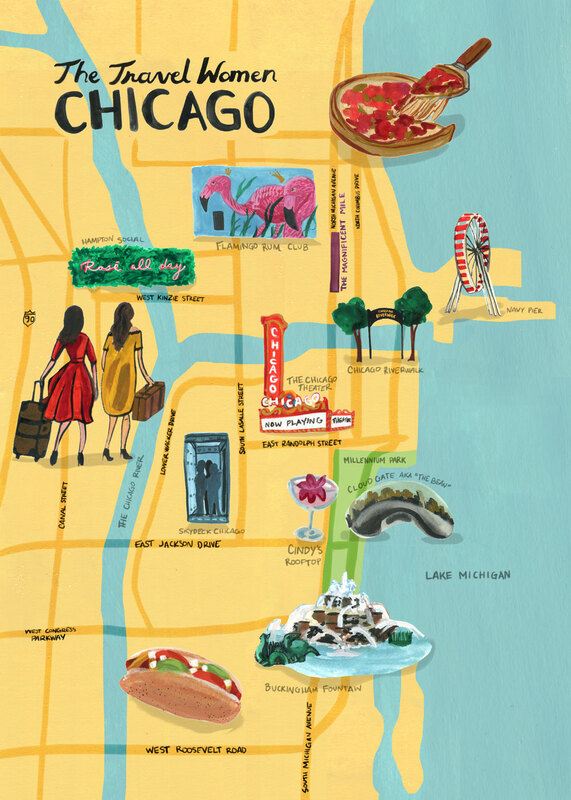 The homeplace of Jazz, deep-dish pizza and the world’s first skyscraper, Chicago is second to no city! In fact, it was nicknamed the “second city” because a majority of thebuildings were reconstructed after the Great Chicago fire in 1871, establishng the rebuilt Chicago skyline as the architectural epicenter it is today. When a city’s top attractions are The Ledge on the 103rd floor, Frank Lloyd Wright’s home and architecture boat tours, you know this is a city built for architecture lovers! The third-largest city in the U.S., Chicago is one of the cleanest, greenest, and friendliest big cities. 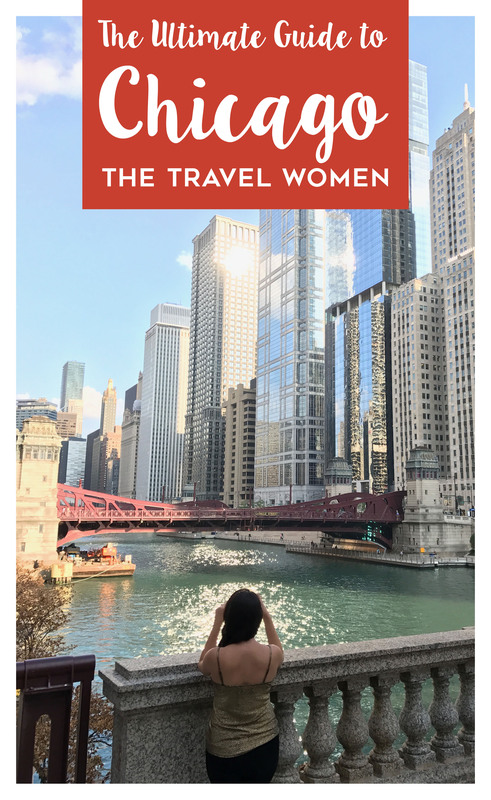 From comedy to world-class museums, Chi-Town has something for everyone, including a gorgeous train station where some of the most beautiful long-haul train routes begin their journey! Trains: Chicago Union Station, started in 1913, is one of the most beautiful train stations in the country with its large barrel-vaulted Great Hall. It is one of the biggest train hubs in the country uniting the four railroads at the time: the Pennsylvania Railroad; Chicago, Burlington and Quincy Railroad; Michigan Central Railroad; and the Chicago, Milwaukee and St. Paul Railway. Union Station is the only example in the United States of a “double-stub” station, where the train tracks travel in two different directions from the station. Amtrak’s Metropolitan Lounge is a comfortable space for Amtrak’s business class, sleeping car customers or reward members, which makes time fly when you’re waiting for a train. Union Station has even been featured in movies such as The Untouchables and My Best Friend’s Wedding. Read more about why Chicago’s Union Station is one of the Most Beautiful Stations in America. Thank you Amtrak for sponsoring this blog post, as always all opinions are my own. Flights: Fly into Chicago’s O’Hare airport, one of the busiest airports in the U.S. which is also full of colorful art. Wander beneath the longest neon sculpture in the world down the walkway between concourses B and C.
Local Transportation: Take the CTA line around the loop to get further outside Chicago, or ride the light blue Divvy bikes where you need to go. When to visit: Visit Chicago between April and May or September and October for warm weather and fewer crowds. Summer is the most popular time, but prices are better just before or after summer months. “Jazz” was invented in Chicago in 1914 by local musicians. The world’s first skyscraper was built in 1885 in Chicago. After the Great Chicago Fire in 1871 destroyed much of the city, Chicago invented the skyscraper as they needed to innovate building on swampy ground with steel frames. Jane Addams who founded the Hull House was the first American woman to win the Nobel Peace Prize in 1931. In 1900, Chicago reversed the flow of the Chicago River to empty into the Mississippi instead of Lake Michigan. In honor of St. Patrick’s Day, the Chicago River is dyed green every year on March 17th. Route 66 begins in Chicago at Grant Park. The first Ferris wheel was built in Chicago for the 1893 Expo. The current Navy Pier wheel is designed after the original. Wrigley Field is the second oldest Major League ballpark, only after Boston’s Fenway Park. Skydeck and The Ledge: The tallest building in Chicago and the second-tallest in the U.S. boasts unmatched views and one of the most unique experiences, allowing you to stand on air at The Ledge. 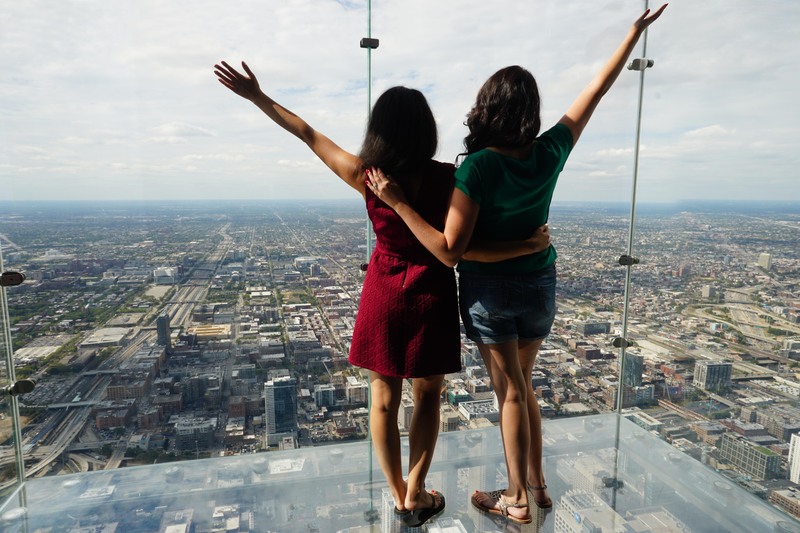 The Ledge consists of four platforms sticking out of the building with glass walls, ceiling and floor for the ultimate Chicago souvenir photos. Read more in our 11 Reasons Why The Ledge is the Best Thing To Do in Chicago. Millennium Park and Cloud Gate: Millennium Park visitors flock to Cloud Gate, the stainless-steel sculpture which is best known as “The Bean.” This mirrored piece reflects the Chicago skyline and is best visited early in the morning to avoid crowds. 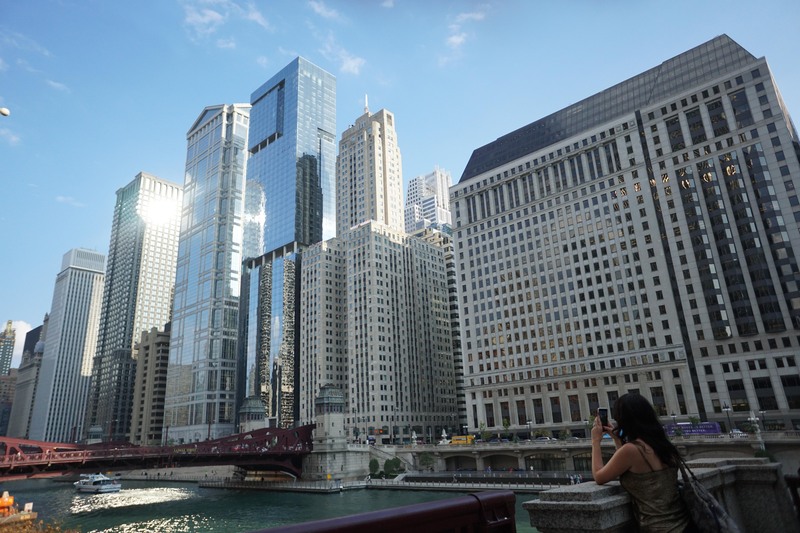 Riverwalk: The Chicago Riverwalk of beautiful pedestrian walkways spans from Lake Shore Drive to Franklin street along the main branch of the Chicago River. Enjoy art installations, restaurants, bars and gorgeous views of Chicago along the Riverwalk. Architecture boat tour: Learn about the unique architectural history and foundation of Chicago’s skyline. Take the original tour with Wendella Sightseeing or take their more relaxed sunset cruise along the Michigan river with unparalleled city views. Frank Lloyd Wright Home and Studio: Architecture lovers can visit Wright’s Home and Studio, which he designed and built in 1889 when he was only 22 years old. Take a guided tour through this architectural dream to learn about his life and his revolutionary work. During your visit check out his 27 buildings in the Oak Park area, some accessible by foot from his home. Chicago Theater: See comedy, theater and musical shows at this vintage venue opened in 1921. The Chicago Theater marquee sign of red and yellow lights is likely second only to Cloud Gate among the most recognizable Chicago attractions. Magnificent Mile: The Magnificent Mile windows sparkle with designer and luxury goods along Michigan Avenue. Enjoy unique architectural facades and the not to be missed historic water tower, which survived the Great Chicago Fire of 1871. Navy Pier: Families will love the picturesque views, Ferris wheel, carousel and more. It is a popular tourist attraction though, so visit early (around 10am) to evade crowds. The Second City: This comedy mecca hosts shows that will make you laugh until you cry. Second City alums have gone on to be top comedians like Tina Fey and Chris Farley. Buckingham Fountain: Located in Grant Park, this fountain hosts hourly water shows in the summer. For more places to go, read our unusual and Instagrammable things to do in Chicago from Parsons Chicken & Fish to the Barrel Run. Art Institute of Chicago: Founded in 1879, The Art Institute of Chicago is one of the oldest and largest museums in the United States, with the largest collection of Impressionist paintings outside of Paris. Admire some of the most iconic paintings, from Vincent Van Gogh’s The Bedroom, to Monet’s Water Lilies to Seurat’s A Sunday Afternoon on the Island of La Grande Jatte. The Field Museum: Wander between Dinosaurs, Egyptian tombs and a Chinese rock garden in this gem of a museum! Museum of Science and Industry: Explore one of the largest science museums in the world to see a Mirror Maze, Science Storms and The Great Train Story. Museum of Contemporary Art: Visit the Museum of Contemporary Art to view one of the largest collections of modern art in the nation. The Museum just underwent a large renovation adding a public gathering space and new restaurant with head chef, Jason Hammel. National Museum of Mexican Art: Located in the Pilsen neighborhood, the museum houses a permanent collection of 10,000 pieces documenting 3,000 years of Mexican history and culture. Best Pizza: One cannot visit Chicago without trying their signature deep-dish pizza. Baked in a bowl, the sausage and sauce go on top of the mozzarella cheese, and locals insist it should be eaten with a knife and fork. Though deep-dish steals the spotlight, there are other pizza varieties worth trying, like stuffed pizza, pan pizza and even South Side Thin Crust pizza. Lou Malnati’s Pizzeria: Lou Malnati’s many locations serve some of the best classic deep-dish pizza in Chicago complete with the trademarked Buttercrust. Chicago Pizza & Oven Grinder: Baked upside down and flipped tableside, these pies are essentially a bread bowl crust full of cheesy Bolognese sauce. Forno Rosso Pizzeria: Nick Nitti studied the art of Pizza Napoletana under Napoli’s top Pizzaiolos before opening his Napoletana-style pizzeria which also offers gluten-free pizza options. 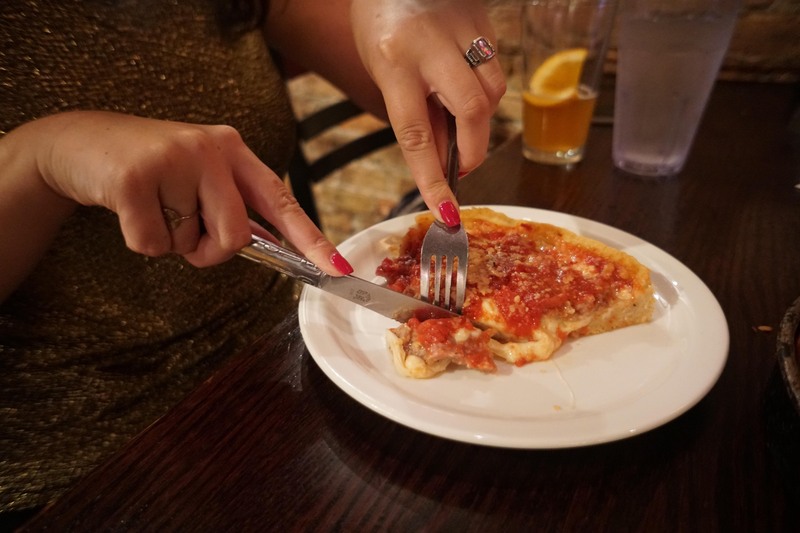 Barraco’s: Barraco’s carries thin crust, stuffed crust, deep-dish and Sicilian style pizza, but you must try the South Side classic thin crust pizza! Pizzeria Uno: Visit the original Pizzeria Uno on Ohio and Wabash where it is rumored that deep-dish was first invented in 1943. Giordano’s: With over 50 locations, Giordano’s double-crusted cheese stuffed pie is one of the best stuffed pizza options in the city. Pequod’s Pizza: This pan pizza variation is set apart from traditional deep-dish with the blackened cheese edge. 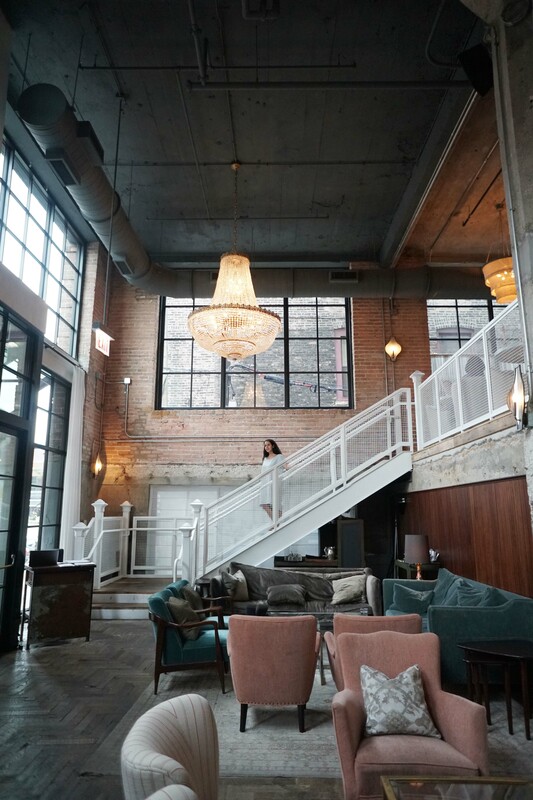 The Allis: Visit Chicago’s Soho House for industrial-chic décor and a meal or afternoon tea experience. For what to order and more gorgeous photos of the space, check out our photo review. Cindy’s Rooftop: Gather for brunch or drinks with the best view over Millennium Park and Cloud Atlas. Order the prettiest and yummiest drink, the Grey Garden, which includes Tito’s, dolin blanc, crème de violette, emperor’s jasmine pearl tea, and lemon, topped with an orchid flower. 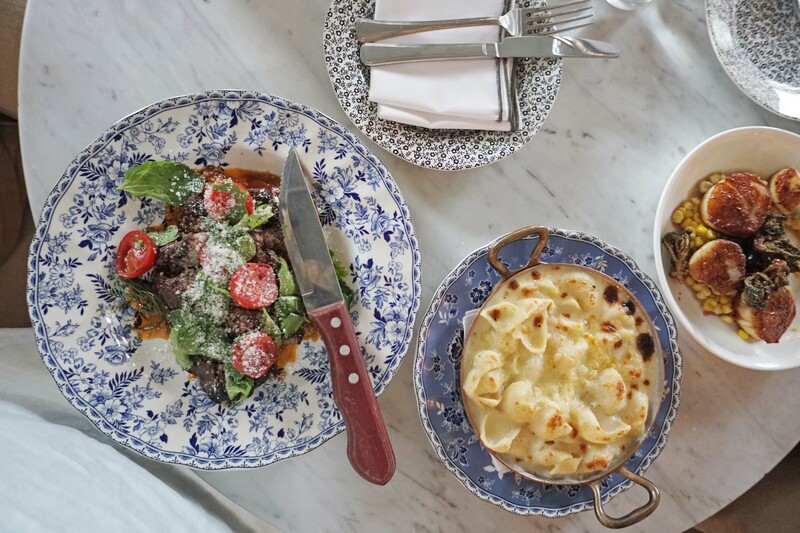 Three Arts Club Café: Located inside Restoration Hardware, this is a beautiful, well-lit oasis that feels like an elegant park complete with fountain and chandeliers. Honey Butter Fried Chicken: Dip chicken in finger-licking honey butter at this popular joint. Au Cheval: Wait in line for what many laud as the best burger in the country. What really steals the show is the sweet thick-cut bacon on these burgers and the aioli dip for fries! Stan’s Donuts: The quickly expanding Stan’s Donuts shops carry colorful and fun donuts, bagels and shakes. Green Street Smoked Meats: Wander into the alley with sparkling lights for some of the most authentic Texas barbecue outside of Texas. Parsons Chicken and Fish: Visit Chicago’s Logan Square neighborhood for the vibrant land and sea dishes and super fun red and white seasonal patio umbrellas. Canton Regio: For authentic Mexican food, visit the Pilsen neighborhood (and don’t forget to check out the Pilsen art walls). One top local recommended spot is Canton Regio, which serves authentic Northern Mexican style food in large portions. Don’t forget, it is cash only and also BYOB. La Michoacana Paleteria y Neveria: Satisfy your sweet tooth with a vibrant and colorful paleta ice cream pop. Mindy’s Hot Chocolate: Mindy Segal serves up savory food as well, but the hot chocolates served with house-made marshmallows steal the show with flavors like Mexican, Matcha Mint and the option to spike your hot chocolate! Mott Street: Devour Asian street food on a fun patio along Wicker Park. Portillo’s: For Chicago street food and hot dogs served with everything (but never ketchup), visit Portillo’s. 1. The Peninsula Chicago: This 5-star hotel on the corner of the Magnificent Mile is the perfect location for a luxury getaway in Chicago, located steps away from shops like Tiffany & Co. and Cartier. 2. Chicago Athletic Association: This historic 1890s athletic club has been restored to offer some of the best luxury rooms. This adult playground includes grand marble staircases and the must-visit Cindy’s rooftop restaurant and bar with some of the best views over Millennium Park and Cloud Atlas. 3. Soho House: Enjoy all the luxuries from Egyptian cotton sheets to walk-in rainforest showers at the well-known Soho House. Highlights include the décor of the open-to-the-public lobby and The Allis restaurant, read more here. Non-members can request to stay at Soho House here. 4. Hotel Lincoln: Stay in the peaceful, happening Lincoln Park neighborhood close to Wrigley Field, Lincoln Park Zoo and Second City Comedy Club, and enjoy the views over the park at the rooftop bar, J Parker. Have you ever been to Chicago? What are some of your favorite things about Chicago? Comment below! Such a great article about Chicago! I have been there many times and love it. On one of my visits, my husband and I took an Amtrak train from NYC to Chicago. We had such a good time on the train. The video is so great and amazing. You are very talented, Jennifer. The photos are wonderful. I got hungry watching you eat the deep dish pizza. Such an interesting and great post on your blog. I always read your blog and love reading about all the great places you travel to. Keep up the great work! Great post! Thanks for the recommendations! Happy early Thanksgiving! Ah yes, tons of great suggestions! I’m a big fan of Parsons and Green Street. Also love that you included Portillo’s, which in my opinion, has the best Italian Beef in Chicago. Cheers!